A. A day devoted to remembering all the dead. B. A 3-day weekend that marks the beginning of summer. C. A day set aside to remember all Americans who have died in military service. If you picked "C", congrats! You just might be part of a growing minority. Memorial Day does not hold the same spirit and meaning that it used to for many people – a disturbing fact that veterans' and historical organizations would like to change. Well, it's hard to honor a day we don't know much about. Here's a quick run-down on Memorial Day history. According to the US Department of Veterans Affairs, three years after the Civil War ended, on May 5, 1868, "Decoration Day" - which was the precursor to Memorial Day - was officially proclaimed by General John Logan as a time for the nation to decorate the graves of the war dead with flowers. The first major Memorial Day observance was held that year at Arlington National Cemetery. Although numerous towns in several states lay claim to being the birthplace of Memorial Day, the official honor, as declared in 1966 by Congress and President Lyndon Johnson, goes to Waterloo, New York. The Day was initially intended to honor and remember only the Civil War dead, but it was expanded after World War I to include all those who have died serving in American-fought wars. Memorial Day was originally established to be held on May 30th each year. It is thought that May 30th was chosen because this was a time when flowers would be blooming throughout the country, or perhaps because it was not a date marking the anniversary of a battle. Even though Memorial Day was originally declared to be on May 30th of each year, that changed in 1968, when Congress passed the "Uniform Holidays Bill" which moved three holidays – including Memorial Day - from their traditional dates to a specified Monday, creating a convenient three-day weekend. This change has been looked down on by those who claim that it contributes to a loss of meaning and a nonchalant attitude towards the dead. Instead of businesses closing, parades and speeches honoring the fallen, the decoration of graves with flowers and American flags, and the playing of "taps" with which Americans traditionally honored Memorial Day, it has become, to much of the public, nothing more than the first chance to fire up the barbecue with friends on a long weekend. Joe Davis, a spokesman for the Veterans of Foreign Wars, says "Do people care? That's basically what it boils down to. To remember [the soldiers'] sacrifice on behalf of people they don't know, in places they've never been – that's what Memorial Day is all about." 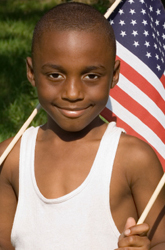 Usmemorialday.org states, "Traditional observance of Memorial day has diminished over the years. Many Americans nowadays have forgotten the meaning and traditions of Memorial Day. At many cemeteries, the graves of the fallen are increasingly ignored, neglected. Most people no longer remember the proper flag etiquette for the day. While there are towns and cities that still hold Memorial Day parades, many have not held a parade in decades. Some people think the day is for honoring any and all dead, and not just those fallen in service to our country." Observe the "National Moment of Remembrance." Established by Congress, this asks all Americans, in an act of national unity, to observe a minute of silence at 3 pm local time, wherever they may be, to honor those who died to protect our freedoms. Take part in events which honor the dead. In your local community, this may be a local flag-pole ceremony or grave decoration at a cemetery. Local VFW groups are also likely to be holding Memorial Day events. Make a donation. Davis recommends making a donation to the VFW Foundation, or the Fisher House, which supports military families in need. Frequent Flyer miles – for any airline – can also be donated to 'Operation Hero Miles', which gives families of wounded servicemen and women free plane tickets to visit their loved ones recovering at military hospitals across the country. Say "thank you." If you meet a veteran, express your thanks for his or her service.